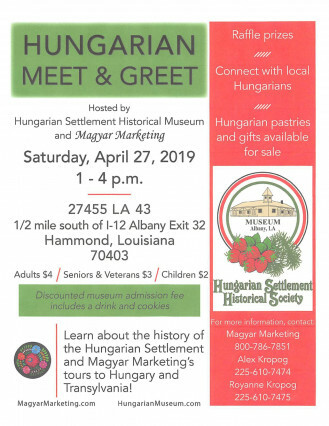 Due to the limited parking space at the Museum for the Hungarian Meet and Greet, please park at the Albany Hungarian Presbyterian Church (30767 Hungarian Presbyterian Church Rd.) just a few blocks away. A sheriff's deputy will be on site to direct you to the offsite parking. From the church parking lot a free shuttle service will deliver you to the museum. Also, the Museum is not equipped to handle credit cards - only cash and checks will be accepted.